Personality: The Newfypoo is a wonderful, alert, friendly, playful, intelligent, loving dog. Family Dog: The Newfypoo makes a wonderful family dog and does great with children if they are properly socailized to them at a young age. Shedding: The Newfypoo is a low to no shed dog. Grooming: The Newfypoo has a fine coat that needs daily grooming. The hair around the eyes can get in the way and needs to be trimmed occasionally. They can have a strong beard needs cleaning regularly. Training: The Newfypoo is a very intelligent dog and takes to positive reinforcement training very quickly. Behavior: The Newfypoo is typically a very calm dog. Barking: Some Newfypoos bark rarely while others are very vocal and bark, woof and wine when they are excited or nervous. Exercise: The Newfypoo needs a daily walk and room to run and exercise. 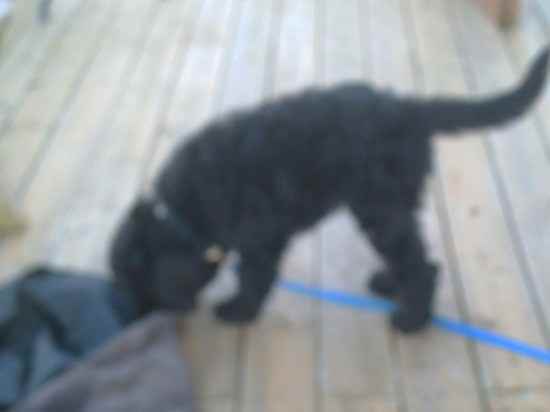 Physical Ability: The Newfypoo is suprisingly quick and agile for their size. Appearance: The Newfypoo is a large, beautiful dog. Size: A fully grown Newfypoo can stand 24 inches tall at the shoulders and weigh between 70 to 100 pounds. Companionship: The Newfypoo makes a wonderful companion dog but if not properly socialized they can be shy around strangers. Head: The head of the Newfypoo is strong and squared off. Gait: The Newfypoo has a light and bouncy gait. Tail: The tail of the Newfypoo can be left long or cropped. Color: The color of the Newfypoos coat depends on the color of the parent's coats. Typical colors are Red, Brown and Black. Coat: The coat of the Newfypoo is long and wavy. Life Expectancy: The average life expectancy of the Newfypoo is 12 years. Characteristics: The Newfypoo is a loving, loyal and smart dog. Allergies: The Newfypoo has no known allergies at this time. Eye Health: The Newfypoo can be prone to cherry eye if not carefully bred.